The city now has the ability to quickly flag inaccurate features in the utility layer. 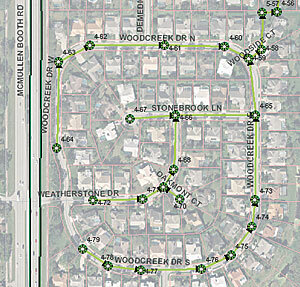 The GIS allows quick uploading and downloading of data each week. Asset management and work order management systems are enhanced. A family-oriented community and home to nearly 18,000 residents on the western shores of Tampa Bay, the city of Safety Harbor, Florida, may have a small-town population but its metropolitan ideas, attitude, and innovation toward the management of the city's resources and infrastructure are very uptown. The City of Safety Harbor's manholes, gravity mains, and force mains are overlaid on the city's 2006 aerial orthophotography with the parcel layer turned on. Safety Harbor's public works utility records historically have been stored as computer-aided design and drafting (CADD) and/or as-built drawings. In some cases, undocumented information could only be found in the personal knowledge that staff accumulated over a long period of time. With the recent passing of its public works director, Kurt Peters, the city lost not only a good friend but also a valuable person knowledgeable about utility assets and a key decision maker who helped build and maintain its overall systems. This sudden loss created an even greater sense of urgency for creating comprehensive utility layers in GIS. The city management embraced and sponsored the beginnings of a GIS implementation and formulated a plan to move its data into the world of GIS. A task force was formed that included the city engineer, public works director, the IT and planning departments, and the finance director. To implement the new GIS, the task force selected as a consultant the North Carolina-based engineering and surveying firm McKim & Creed, an Esri Business Partner, based on previous engineering work completed for the city. Using Esri software recommended by its consultant, the city moved very quickly from the implementation phase to the data development phase. One of its first priorities was to locate and map all of its aboveground water, sewer, and storm water surface featuresmore than 10,000 points in allby using mapping-grade submeter-accurate Trimble GPS units. "The speed and quality of service that the GIS has offered to staff have drastically reduced time needed to search paper documents and allowed staff to concentrate on additional significant duties," says Barry Hill, GIS coordinator for the City of Safety Harbor. With a Tablet PC mobile field device and the existing digital features from the city's CADD Atlas drawings, the hydrants, valves, manholes, inlets, and other basemapping layers were loaded into ArcPad GIS software. The coordinates and predetermined attribute information for each surface point in the utility network were logged. The ArcPad check-in/checkout process allowed for quick uploading and downloading of data each week. 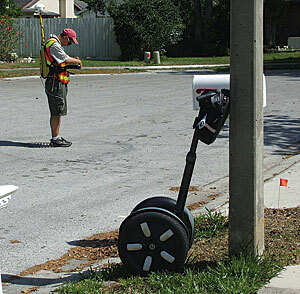 A GIS field data collection technician takes a GPS reading at a manhole feature using a Segway personal transporter. As the field crew found each feature, a GPS reading was taken and the existing point was automatically moved to the correct location based on the new GPS coordinate. Once the point was moved, the field crew member used customized forms based on the geodatabase structure, including drop-down menus pulled from the geodatabase domains, to quickly populate the appropriate information for the feature. The field crews added descriptive information about the location of a feature, such as "under pavement" or "under grass," that allows city maintenance staff to easily locate hard-to-find features. Due to challenges in the fieldsuch as the heavy tree canopy and extensive vegetation of the Florida environmentlaser range finders and magnetic locators were used to locate difficult features. Once a feature was located and mapped to its correct spatial location in the water, sewer, and storm water networks, the data was uploaded back to the office geodatabase for final processing. There were more than 20 feature classes in the city's water/sewer/storm water systems, and each feature was populated with detailed attribute information in an ArcGIS personal geodatabase. Fifteen to 20 attributes were populated for each feature class in the geodatabase, including important information such as x,y coordinates; diameter; ID; manufacturer; address; feature type; material; and owner. The majority of information included in the geodatabase was found in various record documents the city either currently maintains, such as CAD drawings and index spreadsheets of invert elevation information for sewer and storm water manholes, or from documents the city has archived that were scanned and georeferenced, such as as-built drawings and storm water feature inspection forms. This plethora of source documents added the finishing touches to create a complete representation of the city's utility infrastructure. 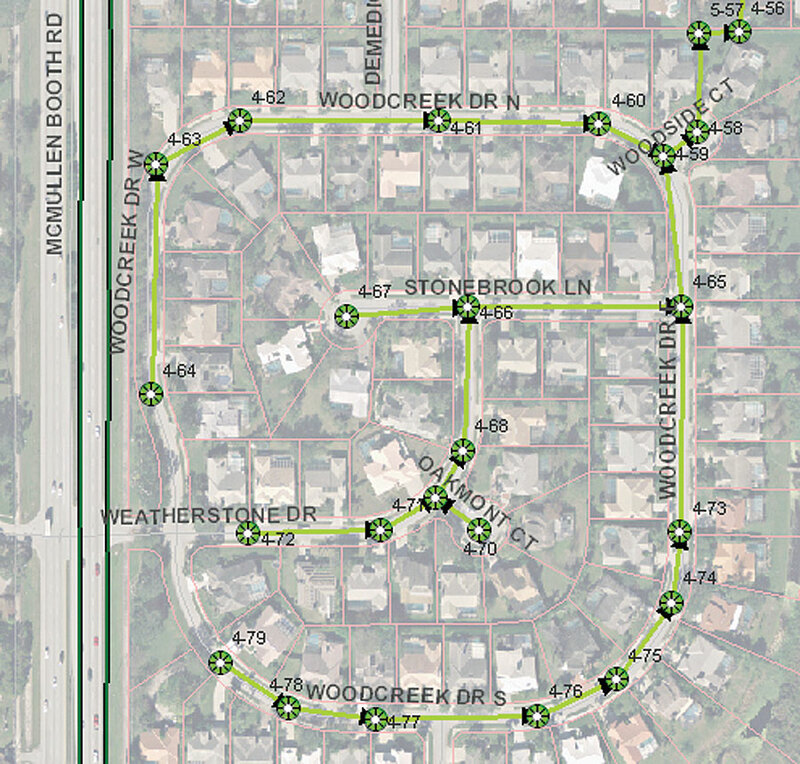 As the utility surface features were collected and uploaded back to the office, the in-house GIS technicians built the piping network to connect the point features to represent the water/sewer/storm water systems. As a final quality assurance and quality control method for the point/line network, McKim & Creed built topology rules created using ArcEditor. "Building topology rules gave us the ability to quickly flag features that were not correctly snapped or split as they should be for a quality GIS utility layer," says Julie Willett, GIS production lead at McKim & Creed. The last step during field collection was for the field crews to conduct a final pass through the project area with a city maintenance staff member to locate any features that were not initially found. This allowed additional information regarding the status and locations of features to be added to the GIS. As a result, the team determined that many previously mapped utility features in CADD no longer existed. These features were pulled into a separate feature class for historical reference as abandoned or removed features. This project was completed in the summer of 2007. City staff members now have the capability to locate assets from their desks and to query information about specific subsets of information needed to daily manage their utility systems. "With the utilities information being in digital format and spatially correct, not only are our GIS capabilities for public works and engineering greatly enhanced, but our asset management and work order management systems are facilitated as well," says Hill. "I'm very excited and looking forward to the City of Safety Harbor experiencing the power of GIS. It's a win-win situation for everyone involved." For more information, contact Barry Hill, GIS coordinator, City of Safety Harbor (tel. : 727-724-1555, e-mail: bhill@cityofsafetyharbor.com), or Julie Willett, McKim & Creed (tel. : 919-233-8091, e-mail: jwillett@mckimcreed.com).